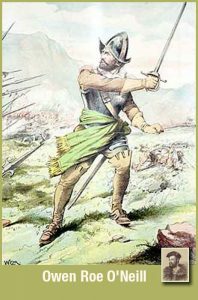 The 17th century dawned in Ireland during the 9-years war of the three Hughs against the Crown, but by the end of 1607 Ireland was leaderless; the Clan system was overthrown, the great Gaelic Houses were destroyed, and a strong foreign power was in possession of the land. The remaining Gaelic royalty had fled in the Flight of the Earls. The conquest of Ireland was complete; or so it seemed. Beneath it all, outlawed poets taught in hedge schools; Priests said mass on rocks in the glens; and the Bards kept the history alive in song and verse. After the Flight of the Earls, James I declared that the departed Chieftains were conspiring to rebel, and confiscated their estates. Four million acres went to any loyal Englishman who agreed to undertake the plantation of Ulster; all they need do was permit no Irish nor Irish customs in the district. Soldiers, clerks, vintners and fishmongers became the new owners of Ireland. Stewart, son of a Presbyterian minister, described them as for the most part the scum of both nations, who from debt…or fleeing justice…came hither hoping to be without fear of man’s laws. The Undertakers, as they were called, hunted the Irish like animals, driving them into woods, mountains, and moors where thousands perished of starvation within sight of the fertile lands their clans once owned. Before their eyes, an alien nation was planted on the face of Ireland’s proudest province. Starving in their own land, their rage grew daily as a leader emerged in the person of Rory Og O’More. With Cormac MacCormac O’Conor, he organized to assist the evicted and protect the clergy. 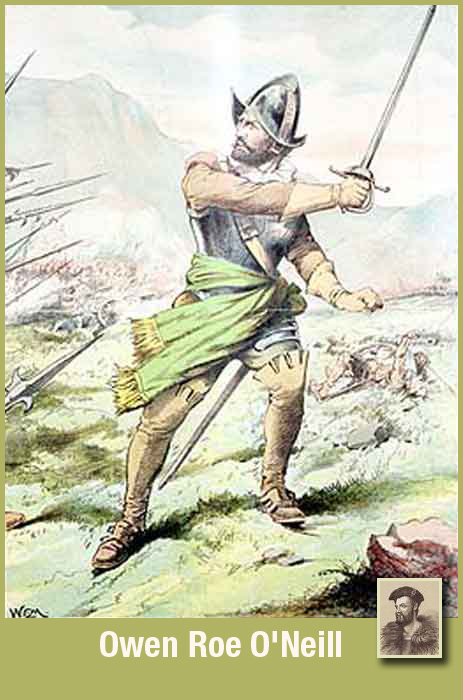 He called on the Irish in the Continental armies for support, and on October 21 1641, led the remnants of the clans from the hills, sweeping the terrified Undertakers before them. In a few hours they made Ulster their own again, and proclaimed Phelim O’Neill head of an Ulster army. By early 1642, the rest of Ireland joined the fight. The Crown, to build its volunteer army, invented a story of a massacre of 600,000 Protestants, even though less than 200,000 Protestants were in Ireland at the time, and a commission after the war could account for no more than 2,019 so-called `murders’, yet the story of the Great Popish Massacre grew into an avalanche of anti-Irish sentiment. On July 6 1642, with 100 officers in his company, Owen Roe O’Neill, landed in Donegal. A mere boy when he left Ireland with his uncle Hugh, the great Earl of Tyrone, during the Flight of the Earls, he had won distinction as a military commander in Spain and was back to lead the fight for Ireland’s freedom. He rebuilt the northern army, challenged the English, and in a few years regained all that was lost due to the procrastination of the Confederation. Ormond, jealous of O’Neill’s growing power, hampered him at every turn. In June 1646, English General Monroe moved against O’Neill with 6,000 men and a field of artillery. O’Neill’s 5,000 men without artillery met and defeated them at the Battle of Benburb; 3,300 English were killed while the Irish lost 70. The English asked the Confederation to sign a peace, and O’Neill rushed south to argue against it. He challenged Ormond who ordered General Preston to attack O’Neill with the 12,000-man southern army. O’Neill not only stood off Preston’s army, but drove them back to the very borders of Kilkenny before returning to his camp at Belturbet, Co. Cavan for the winter. He was growing in strength and soon would be able to win control of Ireland. In 1649, the English civil-war ended with victory for the Puritan anti-monarchists led by Oliver Cromwell. King Charles was beheaded and the newly appointed Council of Officers turned their trained, war toughened, fanatically anti-Catholic army of zealots toward Ireland. On August 14th, Cromwell landed at Dublin with 10,000 foot- soldiers, 4,000 cavalry, and sufficient artillery, stores and money to crush all opposition. He stormed Drogheda, and cut down the defenders to a man. What followed became his trademark: at his personal order, the defenseless civilian population – men, women, & children – were slaughtered. Did they dare, did they dare to slay Owen Roe O’Neill?